Tarzan is a 1999 American animated adventure musical film produced by Walt Disney Feature Animation and released by Walt Disney Pictures. The 37th film in the Walt Disney Animated Classics, it is based on the story Tarzan of the Apes by Edgar Rice Burroughs, and is the first animated major motion picture version of the Tarzan story. Directed by Chris Buck and Kevin Lima with a screenplay by Tab Murphy, Bob Tzudiker, and Noni White, Tarzan features the voices of Tony Goldwyn, Minnie Driver, Glenn Close, and Rosie O'Donnell with Brian Blessed, Lance Henriksen, Wayne Knight, and Nigel Hawthorne. Pre-production of Tarzan began in 1995 with Kevin Lima selected as director, being later joined by animator Chris Buck the same year. Following a first draft by Tab Murphy, Bob Tzudiker, Noni White, and Dave Reynolds were brought in to re-construct the third act and add additional humor to the screenplay. English musician Phil Collins was recruited to compose and record songs which were integrated with a score by Mark Mancina. Meanwhile, the production team embarked on a research trip to Uganda and Kenya to study the gorillas. Animation for the film was done in California, Orlando, Florida, and Paris with Deep Canvas, the pioneering computer animation software system, predominantly used to create three-dimensional backgrounds. This songbook matching the soundtrack from this big Disney hit includes great songs by Phil Collins: Son of Man - Strangers like Me - Trashin' the Camp - Two Worlds - Two Worlds (Finale) - Two Worlds (Reprise) - You'll Be in My Heart - You'll Be in My Heart (Pop Version). Features beautiful color artwork throughout. Spotlight your group with this powerful ballad by Phil Collins. Available: SATB, SAB, 2-Part, ShowTrax CD. Performance Time: Approx. 4:00. This Phil Collins rock ballad, written for Disney's Tarzan, won an Oscar and a Golden Globe, but the defining feature of the song is the simple, heartfelt lyrics. Strategic key changes emphasize the gentle melody while giving the piece motion through it's numerous call and response phrases. The classic ballad from Tarzan by Phil Collins in a remarkable setting for more advanced choirs! Opening as a gentle lullaby, the vocal lines build into an expansive concert work with fully voiced choral harmonies and sweeping piano arpeggios. The arrangement builds through several exciting modulations before returning to the gentle strains of the opening. 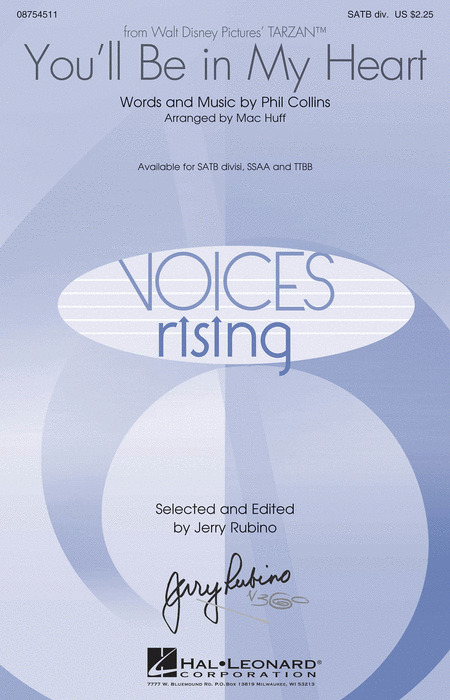 Available separately: SATB div., SSAA, TTBB. Duration: ca. 4:25.